It is a nutritious spinach based accompaniment that is very easy to make at home and enjoyed with hot steamed rice and ghee. 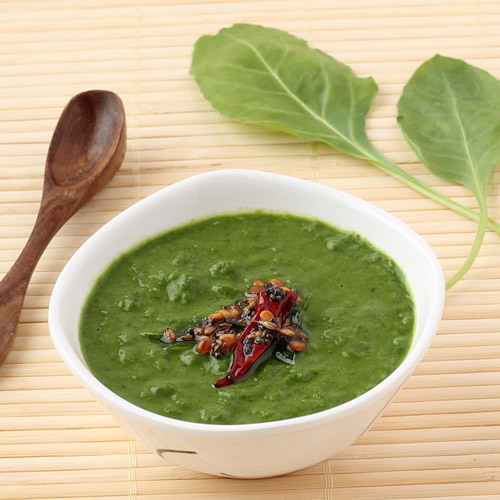 Keerai is a tamil word and it means spinach (palak), Keerai Masiyal can be made in two different ways and both gives different textures – crush sauteed green spinach into smooth puree or retain the texture of cooked greens. In the end, it is seasoned with the tempering mixture of mustard seeds, dry red chillies and curry leaves to give it an extra flavor. This step by step photo recipe follows the first option (smooth puree) to make this palak masiyal. Heat 1-teaspoon oil in a pan over medium flame. Add chopped garlic and sauté for 30-40 seconds. 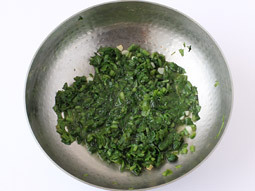 Add chopped spinach, 1/3 cup water, a pinch of sugar and salt. 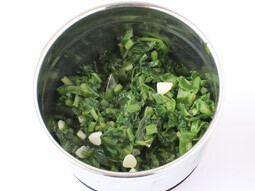 Sugar is added to preserve green color of spinach. However, if you do not want to add it then you can skip it. Cook until spinach turns tender for approx. 4-5 minutes. Turn off flame and cool the mixture for 5-7 minutes. Transfer it to a grinder jar and grind in a grinder or blender until smooth puree. Boil and cook ground puree in the same pan over low flame for 1-2 minutes. Turn off flame and transfer to a serving bowl. Heat the oil in a small tempering pan over medium flame. When oil is medium hot, add mustard seeds; when they start to crackle, add urad dal and sauté until it turns light brown. Add cumin seeds, curry leaves and dry red chilli and sauté for 10 seconds. 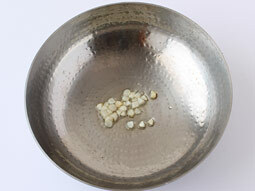 Remove pan from flame and immediately pour prepared tempering over cooked mixture. 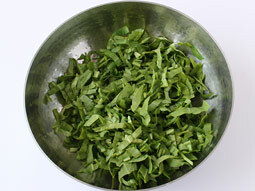 An individual or mixture of greens like fresh mustard leaves, fenugreek leaves and spinach can be used to prepare various types of masiyal. Use yellow dal instead of urad dal. Add sliced onion in tempering mixture and saute until light pink (in step-6) for variation. 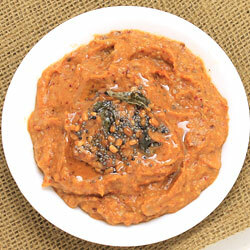 Serving Ideas: Serve it with steamed rice and fried papad in lunch or dinner. You can also serve it as a side accompaniment with curry and rice. Mam, I am not sure from where you picked this version. 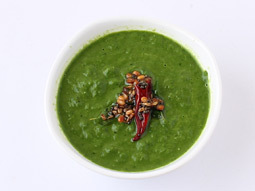 Authentic south Indian version from Tamilnadu is - chopped palak (1 bunch) and 1/4 cup yellow moong dal are boiled in a pan with salt and hing and then tampered with urad dal, red chillies and jeera. It can be served with hot rice. Please do try; you would love it than this ground version. Response: Hi Archana, thanks for sharing the authentic version, I will definitely try your version. I got to know about this recipe from my collegue. I have also mentioned in the description section that you can either ground the spinach or use chopped Spinach to keep the texture chunky, as per your likeness.